More businesses are using SaaS applications like Microsoft Office 365 to save money on upgrades, infrastructure, and management. 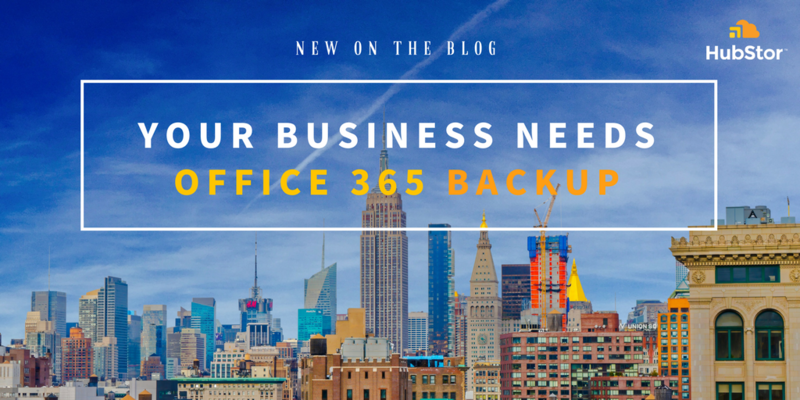 But, should you invest in an Office 365 backup? Like most SaaS providers, Microsoft is good at keeping Office 365 data highly available. It offers resiliency measures like database availability groups, replication and syncing to multiple data centers, lagged database copies, and error detection. However, while Microsoft might be highly available, synchronous storage redundancy of the primary copy does not equate to a backup of your data. If content is maliciously or accidentally deleted, and passes the deleted item retention setting, then how would you recover the content? For this reason, IT leaders require a highly durable content protection solution for their SaaS apps. Should data be corrupted or deleted, you have an external copy to rely upon for recovery. On-premise data is subject to corruption and unwanted deletion too, but IT can restore good copies from traditional backup. The problem with protecting SaaS applications is that IT can’t use traditional backup, since they do not own or operate the provider’s cloud infrastructure. For example, traditional backup can't access Exchange Online or SharePoint Online the same way -- through application-aware VSS snapshots -- as it can Exchange Server or SharePoint Server on-prem. To a large extent, SaaS apps such as Office 365 level the playing field between backup and archiving vendors since there is only one interface to obtain content from these cloud apps. In other words, no VSS shadow copies, no system state, no application/database/files consistency groups. Instead, just the content and permissions via a throttled web services API. Today, if you do a Web search for Office 365 backup solutions, you will get pages and pages of vendors offering data protection for O365. Where do you start? Do you go with the recognized name? Exactly what types of Office 365 content can they protect? Typically, a vendor will handle Exchange Online content, and nothing else. Or, they'll handle SharePoint Online or OneDrive for Business, but nothing else. The issue is that Office 365 represents different applications and data types, and most of the vendors today only have expertise in a few. You probably want an Office 365 content solution that covers user mailboxes, public folder mailboxes, shared mailboxes, groups, team sites, SharePoint sites, OneDrive for Business, and the unified audit log. How and where is the data stored? Is data stored in a proprietary format? Do you have to manage the infrastructure or is it delivered as a fully managed SaaS solution? Can you choose where it is stored in the cloud? If it is encrypted at rest? What level of storage redundancy it has? What can you do with the data? Does the SaaS backup only serve recovery scenarios, or can it also serve as an active archive and business continuity solution? Are Traditional Backup Vendors Staying Relevant? One traditional backup vendor has made the leap to SaaS backup for Exchange Online. They harvest messages from Office 365 and write them to an Exchange database either on-prem or in the cloud. They store the data to a native Exchange database which is great for data integrity, but, as we know, can be cumbersome to scale for large enterprise requirements. Despite admitting to significant client demand for SharePoint Online and OneDrive for Business backup, this vendor does not offer support for anything but Exchange Online in their O365 offering. We suspect they won't make the leap to SharePoint content any time soon because it doesn't have a nice data repository option like the Exchange database. Instead, they'd have to build out a sophisticated object storage backend. Traditional backup vendors typically want to write the data in either a special backup format, or to the application's native database format, because their chief concern is recovery and not much else. However, things are changing in the cloud. Object storage is where it's at because it offers more value, and, as we'll see, supports a wide variety of unstructured data workloads. So instead of just being a backup, your secondary copy can be used for converged data protection, discovery, analytics, business continuity, and long-term retention with self-service access. The exception to these narrow offerings is HubStor, whose intelligent secondary storage in the Azure cloud doubles as an archive, Office 365 backup service, data management platform, and business continuity solution. HubStor software accesses its customers’ Office 365 accounts, harvests their data, and builds a secure and searchable backup and archive in Microsoft Azure. Data includes user mailboxes (email, messages, calendars, and tasks), public folder and shared mailboxes, unified audit log, SharePoint, OneDrive for Business, and group and team sites. Protects mission-critical data from deletion and corruption. HubStor does a synthetic full backup (aka. a forever incremental), automatically merging any changes into the backup. The data is searchable and easily restorable with versioning and point-in-time. Offers low-cost backup in the public cloud. Azure’s hyperscale architecture lets HubStor customers cost-effectively store Office 365 data. As customers are finding, keeping cold data and long-term retention workloads in SharePoint Online can get expensive. Archiving this data to Azure provides better economics, and with HubStor you continue to have search, in-place holds, and data governance over the content. Enables fast recovery. Fast and flexible recovery options include restoring individual messages, list items, folders, lists, sites, and mailboxes, as well as bulk operations across multiple mailboxes or sites. Customers can filter recovery searches by content metadata as well as date ranges. HubStor enables site-wide to item-level restores. Ensures high security. HubStor operates exclusively in Azure with tight integration to Azure Active Directory and synchronized access control for self-service user access in a business continuity scenario. HubStor’s security policies ensure strict data-level authorization, allowing authorized users to retrieve, search, and share their Office 365 content securely from the online backup. We cannot say it often enough: synchronous redundancy in the cloud is not backup. It will protect you from data loss, but not unwanted changes. 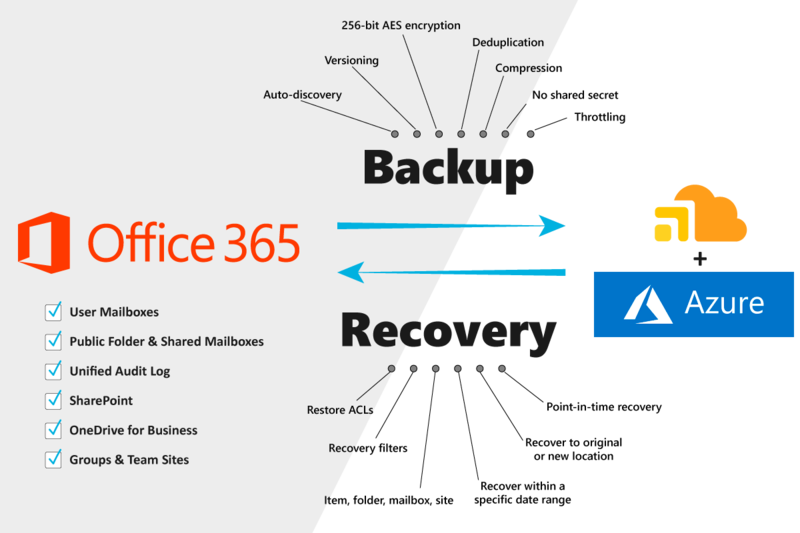 Unless you plan to put all your content on litigation hold in Office 365, you need an external backup like HubStor that protects Office 365 data long-term, and is cost-effective, secure, compliant, and searchable.